The question of my title is the one I’m asking myself after attending public presentations by four planning and design firms invited to the University of Denver (DU) as finalists for a project to improve physical and social connections between the campus and neighborhood. All are global firms, and all specialize in master plans for higher education. The finalists were presented to us by our administration as “some of the greatest urban design thinkers on the planet.” There’s no reason to dispute that assessment. Thus, this was an interesting opportunity to see what happens when world class design firms pitch to a prospective client. I should note that my perspective is limited. I attended all four hours of public meetings. However, our Urban Studies faculty weren’t represented on the firm selection committee, so we didn’t have access to formal written proposals or other application materials. 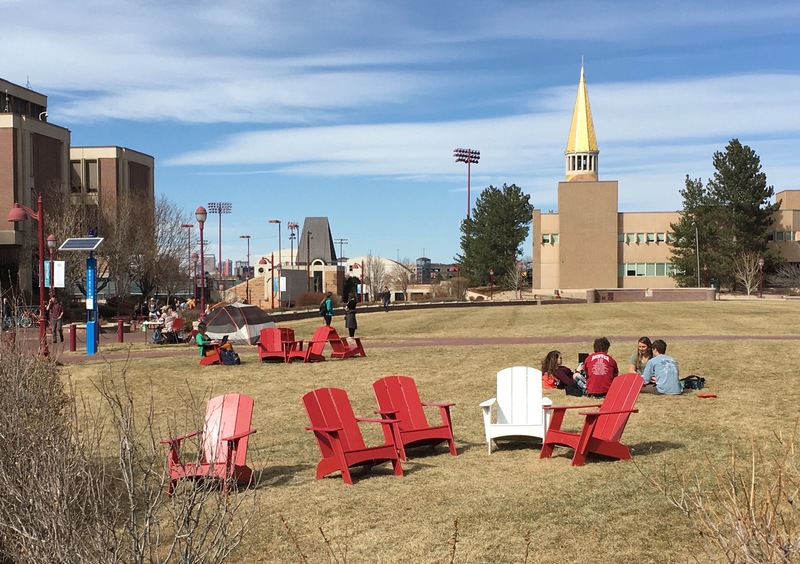 The planning and placemaking challenge at DU is akin to that facing other universities whose neighbors see the academy as an Ivory Tower detached from community. Although DU is a private institution, our vision is to serve the “Public Good.” Thus, it’s important to engage in meaningful ways with the surrounding neighborhood and city, and welcome people in. The photographs accompanying this essay illustrate several physical dimensions of the problem. Campus is bounded on two sides by broad, pedestrian-unfriendly four lane boulevards with another one cutting right through the middle. 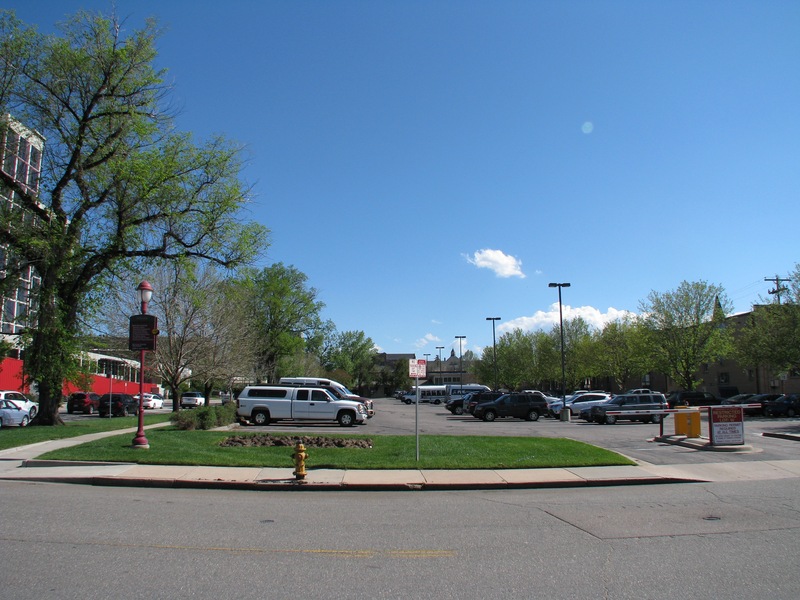 The street frontages between campus and community have a decidedly suburban strip mall character, or consist of surface parking lots. The adjacent light rail station is devoid of amenities and dominated by a parking garage. An Urban Land Institute Advisory Services Panel report describing these and other challenges was sent to prospective applicants along with the university’s Request for Proposal (RFP). 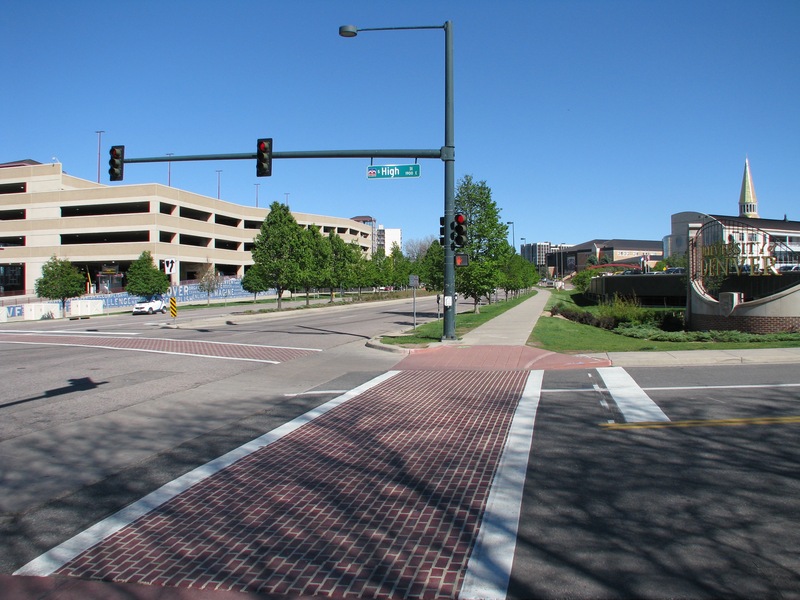 The ULI report suggested a few basic physical interventions: narrow the streets, clearly mark the campus gateways, create better lighting and signage, and activate the edges. It also suggested “multiculturalism” as a central theme for an organizing design strategy, although it didn’t elaborate on what this means and how it might take physical expression. All of the design firms played off of ULI recommendations and the University’s RFP in very similar ways, right down to the language used. We heard a lot about “mixed use,” “catalytic activity,” “vibrant streetscapes,” and the importance of “creating an experience.” The affordability of new residential housing for students and younger faculty was rightly highlighted. The usual Big Thinkers were invoked, most prominently Jane Jacobs and Richard Florida (The Rise of the Creative Class Florida, not The New Urban Crisis Florida). All of the firms promoted a vision of “tech hubs” or “tech labs” as placemaking anchors, thereby privileging what many universities are doing around STEM education to better prepare students for an “innovation economy” and, frankly, to distinguish themselves in a very competitive higher education marketplace. A close second priority was better integrating our academic programs in engineering, business, law, and other professional schools. Commitments to New Urbanism and Tactical Urbanism were on display. We heard a lot about “live/work/play” spaces, and how various kinds of experimental “pop-up” projects can be used to test placemaking concepts. We heard more than once about Farmers’ Markets and Food Trucks. Pocket Parks made an appearance. The firms were not bashful about identifying the “cool places” (and their associated “vibes”) in Denver that make it one of the nation’s most attractive Destination Cities, and that can serve as models for a “DU [Innovation] District.” When an audience member asked the experts what the campus is already doing that’s good, one mentioned the Adirondack Chairs that were recently placed on campus greens. This tells us how far we have to go. A discussion of architecture was also conspicuous by its absence. 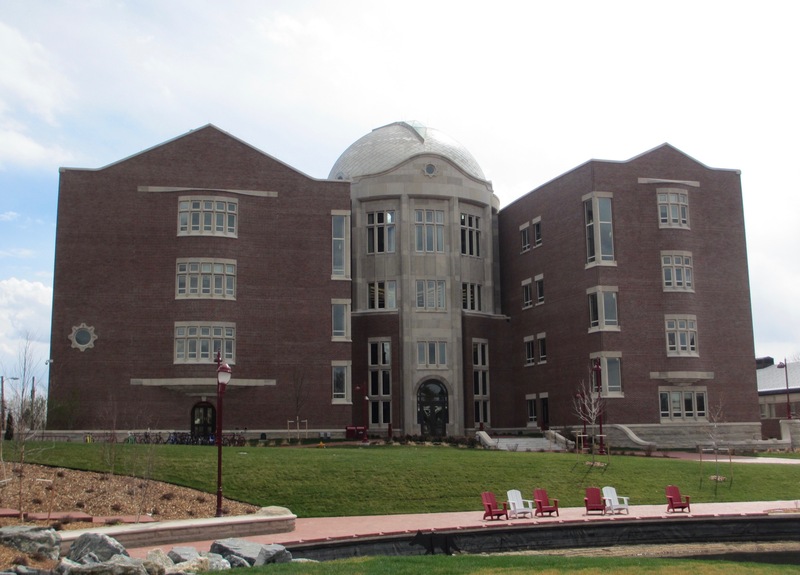 Following a severe financial crisis that nearly destroyed the university in the 1980s, architecture was instrumental to DU’s renaissance in the 1990s. Thus, we’ve learned that architecture is crucial for realizing placemaking goals. It was an audience member at one meeting who probably spoke for more than a few attendees when she pleaded for greater diversity and creativity in the campus’s architectural program. New campus architecture since the 1990s has closely conformed to an aesthetic oriented toward unity and harmony, one often described as “Collegiate Gothic.” It might be time to disrupt that program, in keeping with the wider social and economic disruptions associated with STEM education and, especially, “STEAM” education if we’re keen to add arts to the interdisciplinary mix. Or, in keeping with Denver’s complex and dynamic cultural history. We recently missed an opportunity to make a novel architectural statement with a new Engineering and Computer Science building (see photograph below). The image projected by this big, muscular brick building is, in my view, more autocratic than collegiate…although it does have Adirondack Chairs out front. Campus boundary work presents us with another architectural opportunity to generate not only functional built space, but also something about the meaning of a University of Denver education. We shouldn’t miss it. The design firms were no doubt aware that DU has a strong international profile. We’re a national leader in sending undergraduate students on study abroad, and we have healthy international enrollment in our graduate programs in engineering, computer science, and business. It’s also no secret that the university is challenged by our lack of domestic ethnic diversity. Thus, for me the key placemaking question, and the primary design challenge, is the following: What’s an appropriate edge architecture for signaling to the neighborhood, the city, the nation, and the world that this is an institution dedicated to innovation and boundary crossing, in ways that resonate with faculty, students, and citizens of diverse cultural backgrounds? Crawford’s comment might not be strictly applicable to what we’re doing at DU. Thus, I might be guilty of taking a very cheap shot. However, our very few minority faculty members and students, and our fellow citizens in other neighborhoods, are the best judges of that. Certainly, Crawford’s comment has a renewed relevance in Trump’s America, and for that reason alone might be heeded going forward. It’s also not too late to consider other metaphors and theories for guiding the campus planning and design effort. For example, if we’re interested in framing the university as a site of innovative teaching and learning that’s open to cultural and intellectual diversity, the Corky Gonzales Library in impoverished West Denver is a much better metaphor for our aspirations than the revitalized Union Station, which is reasonably perceived as a monument to downtown Denver’s consumerization and “whiteification.” As I mentioned in a previous post, the university is an incubator of critical inquiry, not a surrogate for the Chamber of Commerce. At the very least, we need a thoughtful approach to placemaking that triangulates between the university’s public good vision, the ideas of multiple stakeholders and communities, and a theory of place, design, and architecture that’s responsive to cultural history, diversity, and meaning.